20.1 percent of districts (111 out of 551) contract out for custodial service. 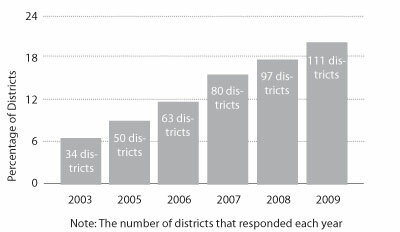 16 districts began contracting out the service. Contracting out custodial services is expected to yield districts $4.4 million in savings. Custodial service contracting grew substantially from 2003, from 6.6 percent of districts to 20.1 percent in 2009. This year more districts contracted out custodial services than in 2008. This was the largest gain in contracting among the three noninstructional services covered. Savings ranged from $10,000 to $2.7 million. Adams Township School District's savings may appear small, but it had a fairly unique experiment with privatization. It hired two contractors to clean different wings of its elementary school. In analyzing the services provided to these wings, the district found that one company cost less than the other, but did an average job, while the other spent more time and performed to a higher standard. The district expects to offer the higher quality company a contract to clean its elementary school. While Detroit Public Schools responded to the survey and stated that it had new custodial service contracts, it was unable to produce documents showing the district's previous costs or any expected savings from the contract. Ann Arbor Public Schools sent documents, but was unable to inform us of proper methods for calculating comparable cost savings. Lake Fenton Public Schools contracted with a supervisor for the district's custodial services and hired him to provide services for the entire year. The district's previous supervisor did not work in the summer. As a result, the district expects to pay $10,000 more for custodial services next year.